A prerequisite to level 1 classes, intro to silks focuses on safety, proper body position, and terminology. Intro includes tying the knot, grips, poses, and climbing to prepare for Level 1 classes. Intro is offered every Sunday at 2, except the first Sunday of the month. Level 1 incorporates beginner climbs, poses, and drops utilizing the knot in addition to strengthening exercises to prepare students for more difficult moves. Once a student has completed all the level 1 - A moves and displays the appropriate strength, they may advance to level 2 by instructor referral. Level 2 incorporates more intermediate climbs, poses, and drops. Level 2 focuses on transitions and stringing moves together to build endurance and begin creating fluid routines. Once a student has mastered the level 2 curriculum and displays the appropriate strength, they may advance to level 3 by instructor referral. Level 3 incorporates advanced climbs, poses, drops, and rolls. Level 3 focuses on high level skills with an emphasis on technique. Open to Students in Level 2 and 3, aerial sequencing explores pathways and connects tricks to improve endurance and hone student's creative abilities. 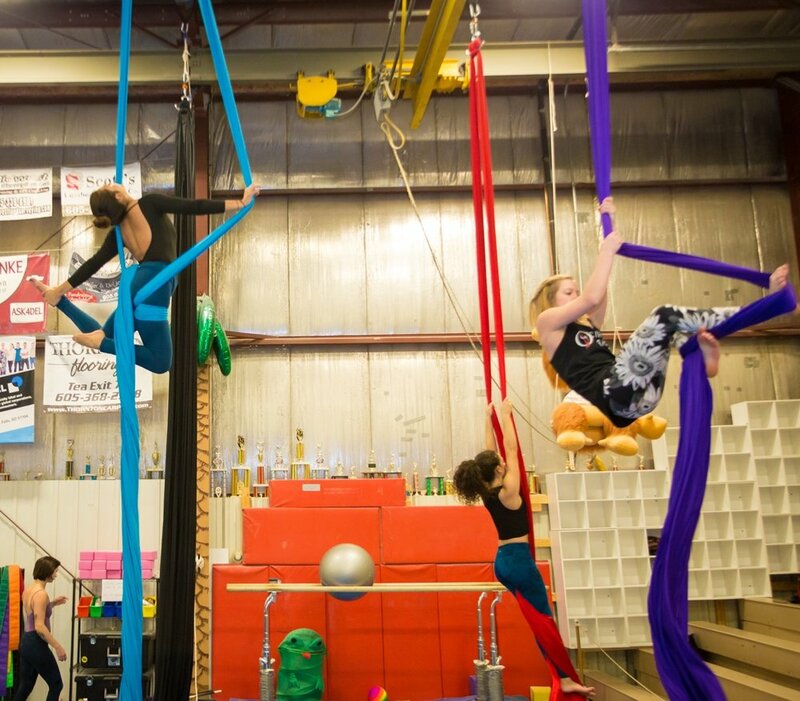 Open Silks is for students looking to practice moves they have learned in class. 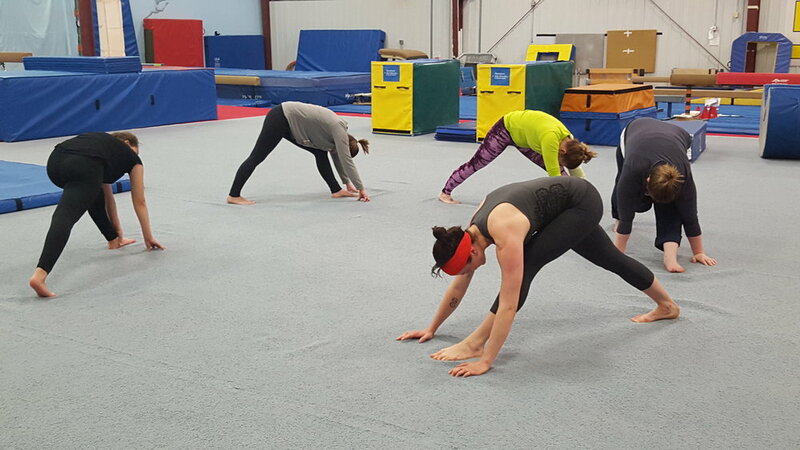 It is also a great opportunity to work on strength and flexibility utilizing the silks. This is not an instruction led class, but an instructor will be present to ensure safety. Students must complete Intro to Silks prior to attending open gym. You may not teach each other or attempt new moves found on social media without explicit permission from your instructor. Attempting new drops seen on social media or done by another student is not okay. However, creative exploration is encouraged once you are comfortable on the fabric. Find new pathways with your wraps and experiment LOW* to the ground. Work on transitions and choreography. Use this time to develop strength and perfect your technique. *LOW means you can reach down and touch the ground, or step off to have a foot on the ground. No dangling if you get stuck, and no chance for falling. This class is for Level 2s and 3s only. This is not an instruction led class, but an instructor will be present for safety purposes. Not your average stretching class! This hour-long class employs different stretching techniques to increase flexibility and range of motion. Safely stretch legs, hips, shoulders, and back. Open to all levels. No aerial experience necessary. Sorry, we do not accept cash or checks. For Information regarding Private Lessons, Parties, and Performances, please contact us via Facebook or Phone. Sometimes we bring in instructors to do unique workshops such as Lyra, Hoop, Acroyoga, and other apparatuses. Keep an eye on our social media to hear more about these opportunities. We also sell gift cards! Punch cards, single classes, and custom amount available. Tax not included.